There is an inexplicable aura around Lebron James. For Lebron to do what he did last night and still be criticized is hard to understand. In case you fell asleep on the couch at halftime, here is a quick recap of what happened. Last night, Lebron James took the cast of characters that is known as the Cleveland Cavaliers into Oracle Arena, and came out with an enormous victory (Cleveland 95 – Golden State 93 F/OT). This series is now headed back to Cleveland tied at one game a piece. If you didn’t see Lebron’s performance, allow his stat line to enter the room: 39 points, 16 rebounds, and 11 assists. Oh hey history, how ya doin?? Does anyone know how many times those numbers have been accomplished in the playoffs, let alone in the finals?! That’s right. The answer would be 0 times. Yes, Lebron seemed to “lose” his touch in the second half (missing 14 of his final 18 shots), and yes, he did get stuffed a few times driving the lane down the stretch, but there is NO denying his greatness. The craziest part is Lebron CAN actually play better. 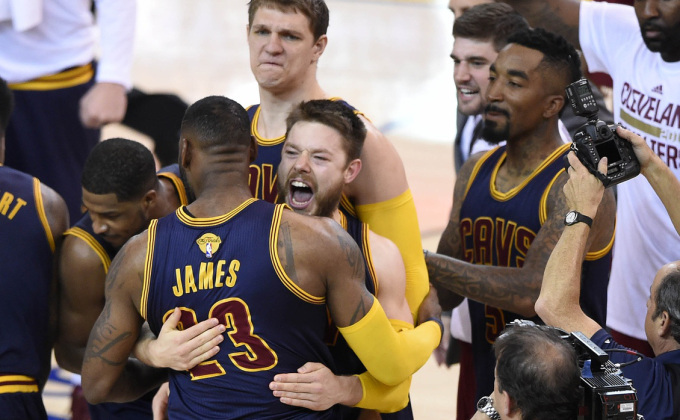 We should all understand the Cavaliers would not be in this position without Lebron, but the real MVP of game 2 was Matthew Dellavedova. The tenacious, hounding defense he played on Stephen Curry was the real reason the Cavaliers stole home court advantage in the series. When being guarded by Dellavedova, Curry was 0 for 8 from the field. Curry was the MVP of the regular season, and is an amazing player, but he could not handle the physical nature of Dellavedova’s defense last night. It would not be wise to write off any team that has Lebron James’ name on the roster, but I still don’t believe his demi-god like performances will be enough to win this series. Side Note: This series can obviously go either way though. This is the first NBA Finals Series to have its first two games decided in overtime. Game 3 will be played in Cleveland on Tuesday night @ 8:30 P.M. You can tune in to ABC to watch the drama unfold. What do you think will happen? Can Lebron James continue his historic play and bring the city of Cleveland its first championship in 51 years? Or will the Golden State Warriors’ team effort prove to be too much for the Cavaliers to handle? Since you enjoy my writing, follow me over to intheneutralzone.com where I am a contributing author there as well. Also you can follow me on twitter @DaveEttinger2 or like me on Facebook at http://www.Facebook.com/DaveTalksSports. Thanks for reading, and I hope you enjoyed it! WELCOME BACK DAVEY! Nice article. I didn’t see the game but, heard about it from some of my students who were dissing “The Greatness”. I can’t imagine anyone being negative about Lebron’s playing abilities. He’s adept at reading the situation and knows how to make his shots count in the clutch. GO CAV’s. Looking forward to more exciting times!